Sanjay will be next seen in Bhoomi while Salman will be seen in Tiger Zinda Hai. There was a time when the movie industry would swear by the friendship of Sanjay Dutt and Salman Khan, so much so that they were dubbed as brothers in arms. But ever since Sanjay Dutt was released after serving his sentence, the rumour mills were running overtime with the reports that the camaraderie between Dutt and Khan has ceased to exist and the two just cannot stand each other anymore. Even though both Sanjay and Salman have been denying any such development Bollywood insiders have reported completely different views. 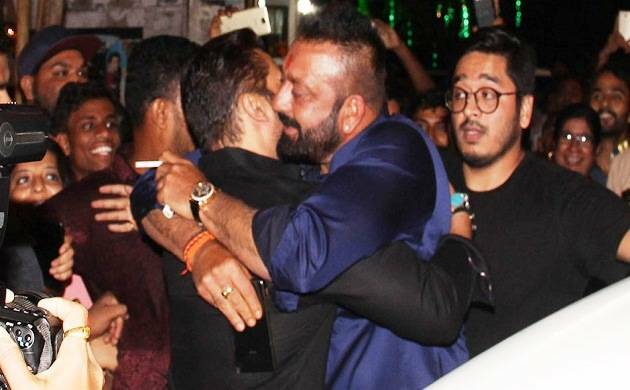 It all happened at the house of Ambanis who had hosted Ganesh Festival celebrations where Sanju ran into Salman and both gave each other a real warm and wholehearted jadoo ki jhappi. The sight thrilled not only those who were present at the venue but the industry as well.